Why would you come to Paris to eat fried chicken? 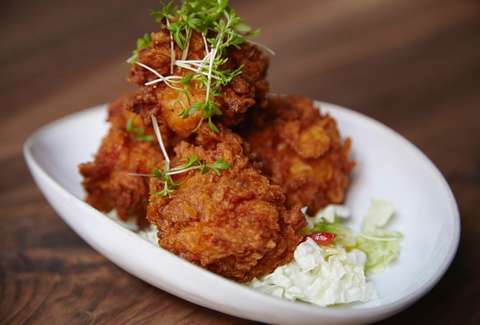 Because the people at Verjus have made fried chicken into a damn art, and you can also get that fried chicken with an excellent glass of wine. 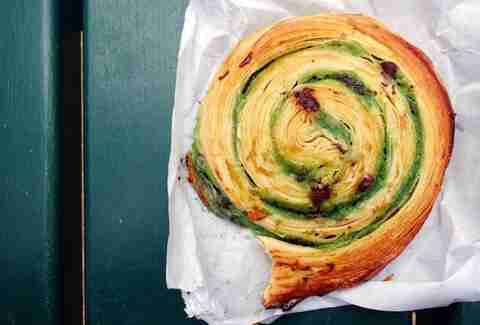 This delicious pastry looks kind of like a snail shell, hence the name. While usually these are filled with a creme patissiere and raisins (and also called Pain aux Raisins), here they’re filled with a sweet pistachio and chocolate combo. You should probably order two. What’s more classic than a plate filled with steak and piled with fries? 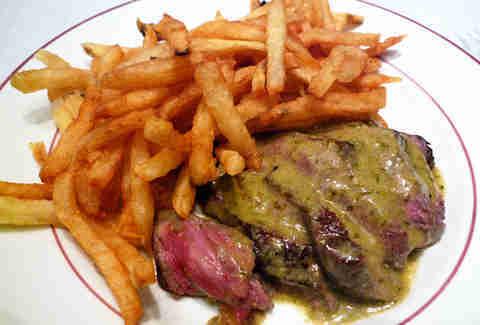 This isn't just Le Relais de L’Entrecôte's best dish, this is its only dish, so it's no wonder it get it so right. And wash that plate down with some red, of course. If you want French comfort food with a modern, gastronomic spin, look no further than L’Ami Jean. This iconic Basque restaurant is a Paris institution, recently revamped with the arrival of a new chef who has breathed life into the place. The menu changes depending on what’s in season, but you can be sure that you’re going to get copious amounts of food and plenty of rustic fare, from pork to hare. 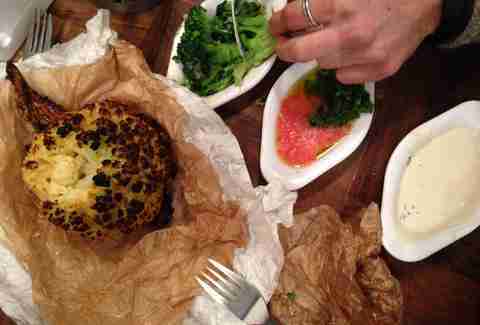 This Tel Aviv street food haven has become a Parisian favorite, and if there’s one thing that people go there for, it’s the roasted cauliflower. Yes, an entire head of it. It’s crispy on the outside, melt-in-your-mouth on the inside and is covered in olive oil. It dips well in the tahini sauce that sits on the serve-yourself counter of condiments, so be sure to stock up on your way to a table. While street food has become trendy in Paris in the food-trucks-selling-expensive-burgers kind of way, if you want real street food at a reasonable price, then you need to head to the back of Marche des Enfants Rouges. Here a guy named Alain serves up the classic street food from Nice. 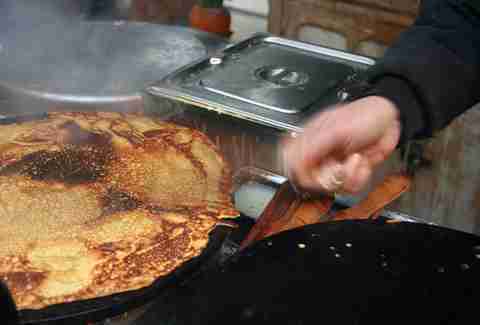 Socca is like a crepe, but made with chickpea flour, and Alain douses it in salt and serves it to you in a paper bag. 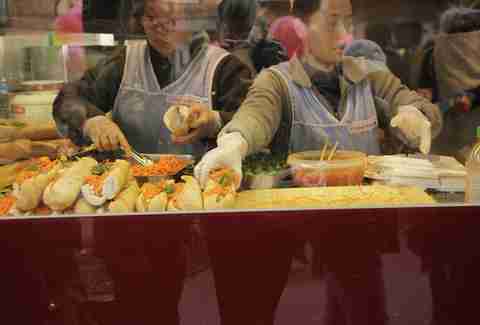 The French brought the Vietnamese baguettes, and in turn, the Vietnamese gave the world bánh mì. The Vietnamese street food has become quite popular in recent years, and you can find bánh mì at several places around town. 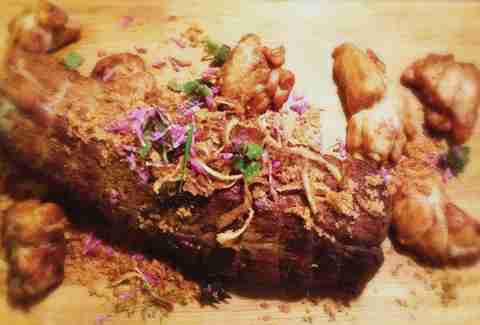 But the cult favorite in Paris comes from Thieng Heng, all the way out in the 13th arrondissement. Just look for the long line of people. 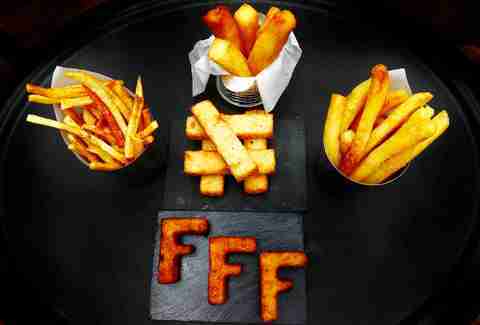 Maison F is known for its fries, and specifically, its fries made from French bread, called pain perdu in French. They’re even doused in caramel before being fried. 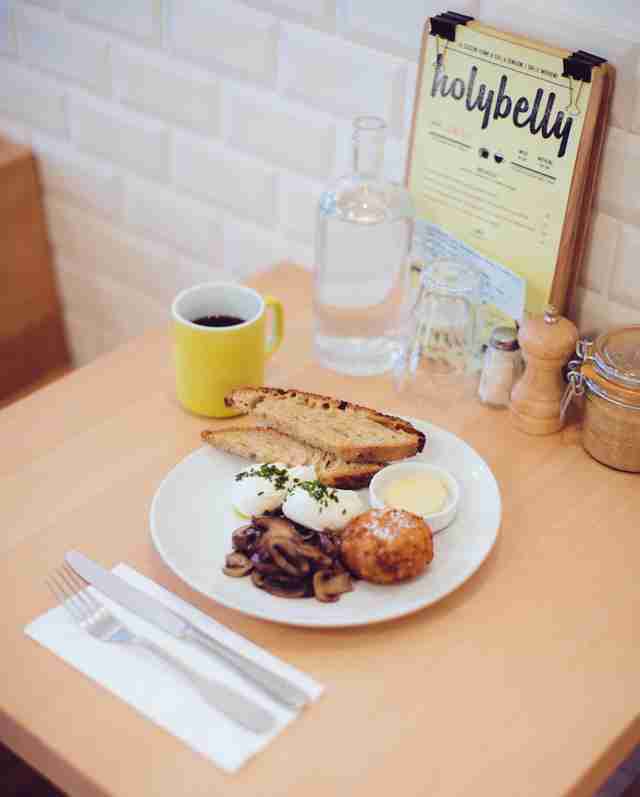 You can get your eggs any style at Holybelly, but opt for the poached and the bright yellow yolk will run all over the other stuff on your plate. Then you can sop it all up with a hearty slice of bread, sourced from local bakery Du Pain et Des Idées. While most people come to France and think that crepes should be served street-sized with Nutella, they’re wrong. 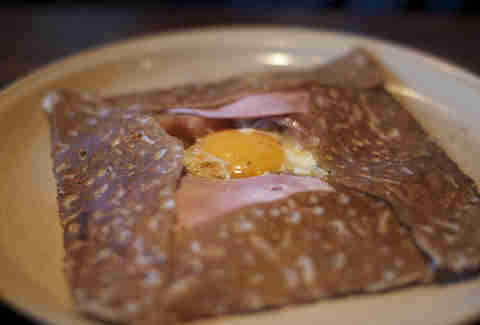 If you want a real crepe experience then you have to do it Breton style, with buckwheat galettes at Breizh Café. There are many different versions and fillings, so go hungry, and leave satisfied that you have had a legitimate crêperie experience. Sure, the city is filled with ridiculous amounts of places selling pizza. 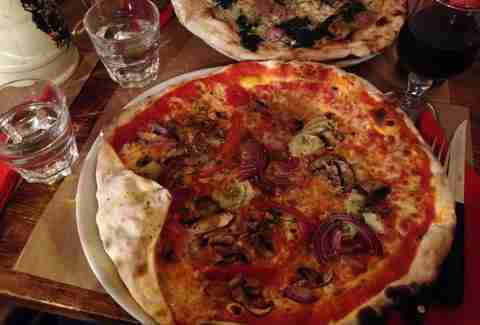 But amongst the hundreds of pizza places, there is only one worth going to: Il Brigante. Run by Brigante himself, you’re better off speaking Italian here than French. You’ll be crammed into the small dining room, right next to the person throwing the pizza dough in the air. Down that pizza with a bottle of Italian red and round it all off with the house tiramisu. 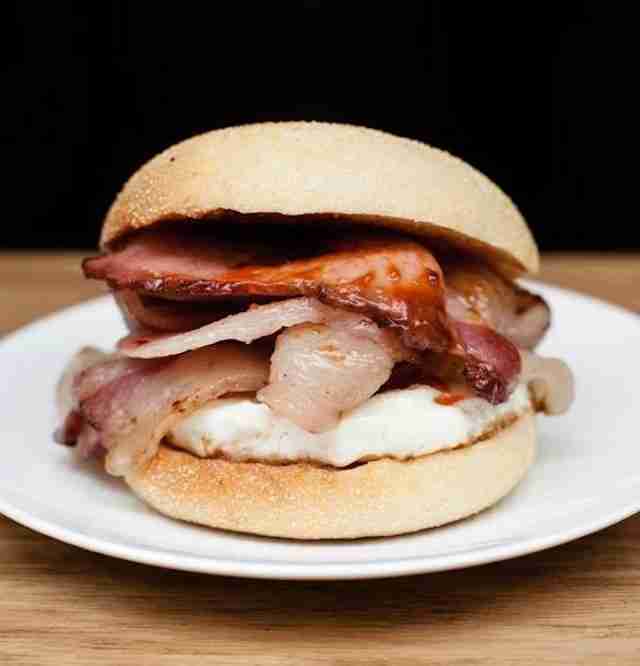 Bacon on an English muffin with eggs. Does breakfast get much better than this? Locals and tourists alike flock to Frenchie To Go for the breakfast alone, and this dish can’t be missed.